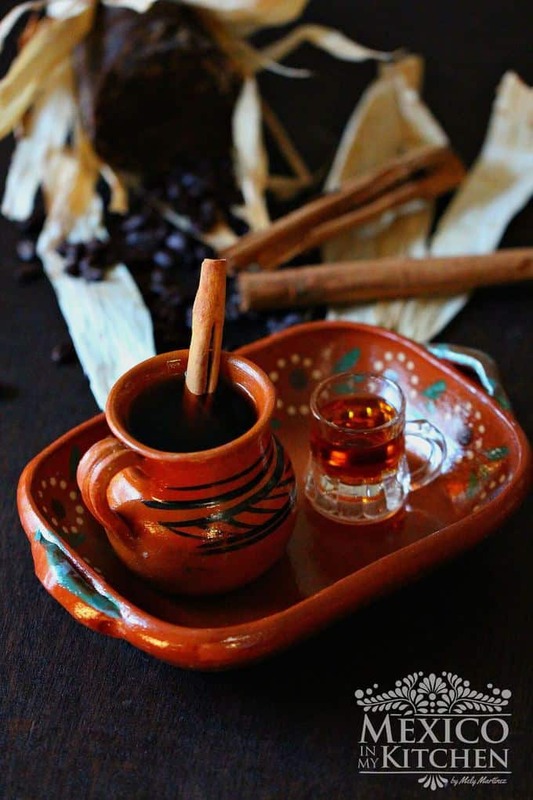 Mexican Spiced Coffee made with Mexican ground coffee, cinnamon, and raw dark sugar that we call “Piloncillo”. This is a traditional recipe enjoyed by generations. There’s one thing that you would always find in my grandma’s kitchen right next to the wood stove: the large enamel blue pot with coffee, no matter the time of day or the season of the year. You will always find coffee. Why?, I don’t know, but that old pot was there for as long as I can remember, and it would always welcome the visitors with a warm cup of coffee. Those times are long gone but the memories are still there, especially on a cold day like this when a good cup of coffee from México with Cinnamon and Piloncillo will warm you up. I love making this coffee when we go camping. The firewood smoke gives an extra flavor to the coffee like the one sold in some of the Mexican small town road restaurants. When the water starts boiling, add the coffee, turn the heat off and stir. Cover the pot and let steep for 5 minutes. Pour through a strainer to serve. If you would like to add some spirits, a Coffee Liqueur-like Kahlúa is a good choice. 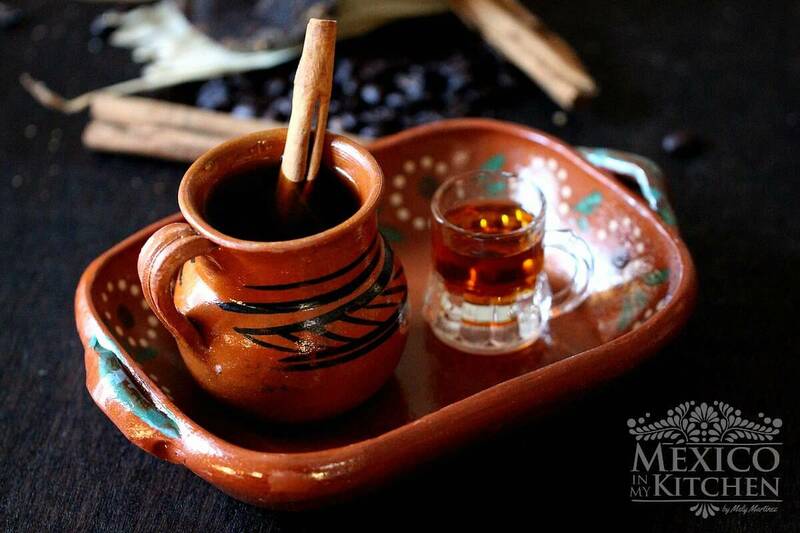 Those times are long gone but the memories are still there, especially on a cold day like this when a good cup of coffee from México with Cinnamon and Piloncillo will warm you up. I love making this coffee when we go camping. 4 Tablespoons of ground Coffee it would be better if you could get a Dark Mexican Coffee. In a Medium saucepan, place the water, cinnamon, and Piloncillo (or brown sugar). Turn heat and simmer until the piloncillo is dissolved. About7 minutes. 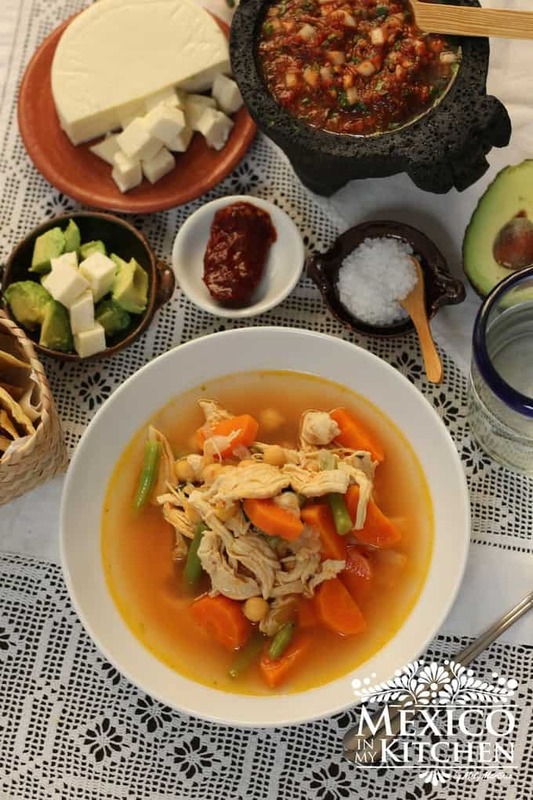 *This is the most common version of Café de Olla, sometimes you will find it with the addition of cloves or anise seeds. * When buying piloncillo/Panela, make sure to look for the pure version, like in the picture above. There is a look-alike version in some stores that are just plain sugar in a cone shape lacking the flavor and nutrients of the real Piloncillo. * To easily cut the piloncillo, warm it up first. This will soften the piloncillo. * Mexican Coffee is easily available online nowadays, try to look for it. Mexican Coffee is considered as a Gourmet Coffee and is Natural Organic Fair Trade Harvested. The Mexico Coffee Industry is ranked number 6th overall out of the top 20 Coffee Producing countries. Do you drink coffee? How do you like it? Sharing with “Simple Lives Thursday” and “Full Plate”. Thank you Melly, I had this coffee in the food court of a Mexican Supermarcado in Delano several years ago one Sunday morning and loved it–finally engaged my brain and did a search for the recipe. Hello Mely. How does one tell the difference between the real piloncillo and the dark sugar cone? Real piloncillo looks like a solid material, it could be dark or light amber. There is a fake piloncillo from China, that is lighter in color and right away you can see that granular sugar in the cone. In Merida, they add stone fruit! Illy is also my favorite. I lived in.Mexico city when I was 25. I'm now 73 and for years I used to wonder how the spanish ( Spain ) used to make a delicious coffe that aS sweet and cinnamonly she would pour about half full and full with milk. I never knew how she made it but I never tasted it again. The recipe for cafe de olla might be it. Any ideA what I'm talking about??? I hope I knew about that coffee you are mentioning it sounds delicious. Now, I also want to know about it. Please do try this recipe, maybe is something similar. Hello Mely – yesterday a group of friends visited a Mexican restaurant in San Juan Capistrano (So. California) and we ordered their "special" coffee. All seven of us were in heaven. So now I'm at your blog, reading the recipe. I found Goya brand panela at amazon. Is it one that you recommend? Amazon has several brands, and perhaps if I sought out a local Mexican market I could find others. Goya's IS a kind of cone shape (and you mention not to buy that type) yet I thought Goya was a good, reputable brand (from Spain, I know). Goya's got the better marks from users at amazon, but there are many other brands with no comments at all. Any advice? Thank you! The Goya brand is more refined but you can still use it. There is a smaller version (cones) that are less refined and render better flavor. Check this link: http://amzn.to/2oh6YSr You can also look for it at latin stores, always choose the ones with a darker color and rough finish. The one for Goya has a light caramel color and other brands sell the same type. Sweet! Can’t wait to make this! Ich liebe Blog. Ich liebe mexikanisches Essen. So glücklich, dass ich dich gefunden habe. Vielen Dank! Hi Mely! I love cafe de la olla! I leave out the piloncillo since I’m diabetic, but make up for the flavor with the canela. I remember drinking this with my grandmother & aunts in Michoacan; good memories. The last time I was there, I bought ground coffee in Uruapan, & almost had to surrender it at the Guadalajara airport. What an ordeal! Anyway, I enjoyed that coffee for a long time! Sweet memories from your aunts and grandmother. It’s a coffee the family loves. Saturday and Sunday’s are for cafe de olla. Thank you for the recipe. I happened upon your site while seeing a yelp review of a local Mexicans restaurant. 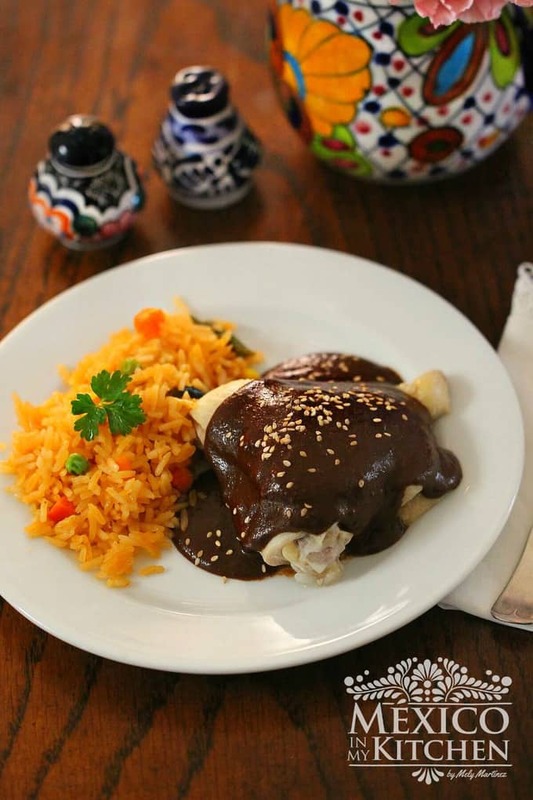 I will seek out authentic piloncillo at one of our local Mexican Marketsbecause I cant wait to try this recipe. So long as it’s a dark roast coffee I’m all in! I grew up enjoying the darkest richest roasted coffees because” that’s how my Italian parents & entire family served it. I’m also interested in trying something called “ (a cool/cold chocolate like beverage that’s vigorously whipped (?) by hand till frothy) if you have a recipe for that I’d love to see it to try it as well. Thank you for stopping by. Is that chocolate drink one from Oaxaca or Veracruz. There are some drinks made with chocolate that have a frothy foam on those 2 state in my country.